One in three Baltimore police officers filed claims for work-related injuries last year, which helped accelerate the city’s medical disability costs to a record $39.2 million. Overall injury claims by municipal employees exceeded performance measure targets by 55% in fiscal 2015, which resulted in about $14 million more in injury costs than was forecast, according to an audit filed yesterday with the Board of Estimates. Four agencies – Police, Public Schools, Public Works and Fire – accounted for 80% of all injury claims and 90.3% of total dollars paid to injured employees, according to data compiled by City Auditor Robert L. McCarty Jr. The biggest increase came from the Police Department, where 1,136 injury claims last year resulted in $16.6 million in current and future expenses to the city, including accident leave, disability benefits, medical costs, hospital charges and rehabilitation. 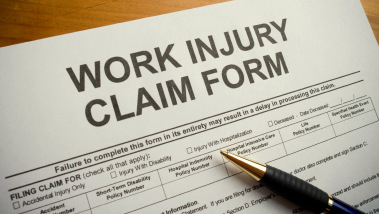 In 2014, there were 990 injury claims from Police, resulting in $12.9 million in costs. Finance Department officials, who are responsible for monitoring injury compensation, attributed the spike in claims to the civic unrest that followed the police-in-custody death of Freddie Gray in April 2015. They said 179 claims were related to the disturbances, which pushed up the number of claims above the 2014 figure. If those claims are removed, total costs for 2015 still remain approximately $2 million over 2014, according to the audit data. Considered a significant factor in the number of disability claims filed by uniformed employees is the labor agreements that the Rawlings-Blake administration signed with the unions. “The police contract allows for an employee to receive 85% of the employees’ gross pay, and the fire contract allows the injured employee to receive 100% of their pay,” noted Finance Director Henry J. Raymond in a response to the audit. So-called “uniform fraud” within the ranks was a preoccupation of Inspector General Robert H. Pearre Jr. in the final year of his three-year tenure as Baltimore’s chief waste and fraud investigator. In his 2016 annual report – issued just days before his surprise resignation was announced by Mayor Stephanie Rawlings-Blake last month – Pearre said his office had uncovered a “large volume of new cases” involving false applications for workers’ compensation and disability retirement in the Police and Fire departments. Pearre said he was in the process of hiring a full-time agent to work with the Office of Risk Management and the Fire and Police Employee Retirement System to combat the fraudulent retirement applications (see page three of this report). 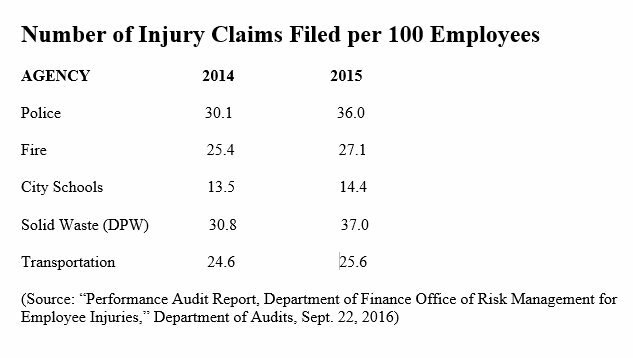 McCarty’s audit found that some city offices, often far removed from the 2015 disturbances, reported spikes in injury claims by employees. One example is the “Miscellaneous Mayoralty Programs” run by Rawlings-Blake. Injury claims in these programs increased from 27 in 2014 (resulting in $71,160 in costs) to 45 in 2015 (resulting in $186,778 in costs), according to the audit. In addition, the audit looked at the Mayor’s Office of Employment Development and found it reported 8 injury claims in 2015 (costing the city $73,573) compared to zero claims in 2014. The mayor’s spokesman, Anthony McCarthy, and Finance Director Raymond did not respond to questions from The Brew about the increased number of claims. In another example, the Office of the Director of Public Works reported one claim in 2014 (which resulted in a $8 charge) and 12 claims in 2015 (which incurred $144,116 in medical and leave costs). In response to our request, the Office of Risk Management said it would research the matter and get back to The Brew. We will publish the information when we receive it. Some agencies reported a reduction in the total number of claims in the two-year period examined by McCarty. They include City Schools (787 claims in 2014 versus 758 in 2015), Department of Transportation (418 in 2014 versus 374 in 2015), Department of Housing and Community Development (48 in 2014 versus 32 in 2015), and DPW’s Bureau of Water and Wastewater (252 in 2014 versus 249 in 2015). These reductions, however, were overwhelmed by the escalating costs of claims from the Police Department and, to a much lesser extent, the Fire Department, whose whose employee medical and leave costs increased by $330,000 in 2015 to $8.2 million. “It’s gone through the normal regulatory framework,” says spokesman for Acting Mayor Jack Young. Marc Weller removes some trees and erects a massive tent at West Covington Park, improved over the years by more than $7 million in public funds.